Although Galaxy Note 5 battery has a smaller capacity than that of Galaxy Note 4 (3000mAh vs 3220mAh), and the battery is non-removable as discussed in top 5 Galaxy Note 5 defects, Samsung did introduce some exciting new technologies in Samsung Galaxy Note 5 battery: fast charging, wireless charging and fast wireless charging. In this guide, I will share with you on how to charge Galaxy Note 5 battery properly, how to use Galaxy Note 5 fast charging, how to use Galaxy Note 5 wireless charging, and how to use Galaxy Note 5 fast wireless charging. Some frequently asked questions on Galaxy Note 5 battery are also answered. Because Galaxy Note 5 battery is sealed behind the glass back cover, you cannot use a spare battery. You also have to visit Samsung service center to replace the battery if needed. Most battery has a life span of 2-5 years depending on usage and cell quality. Heavy users may have to replace the battery after 12-18 months. Properly charging Galaxy Note 5 battery can make your battery last longer. Of course, it is unwise to sacrifice your usage to “protect” you battery: your Galaxy Note 5 costs about $700 and the battery only costs about $50. The value of your Galaxy Note 5 is redeemed through your usage, not through keeping it fresh. Samsung Galaxy Note 5 can be charged through the USB port (multipurpose jack) in the bottom with normal USB cable, or charged wirelessly (read on). In your Galaxy Note 5 box, you can find the charger and an USB cable. You should try to use these official charger and cable. Do not use low-quality chargers. Such chargers may cause fire and may damage your Galaxy Note 5. If you want to get a spare charger, try to get it from reliable suppliers. USB cable may also affect charging. If you want to get a spare USB cable, try to get it from a computer hardware store, not from handphone shops. To charge Galaxy Note 5 through USB cable, you may follow these steps. There is no way to get it wrong! Only the “big” end of the USB cable can be inserted into the charger. Please make sure it is inserted tightly. Step 2: Connect USB cable to Galaxy Note 5. Now, insert the “small” end of the USB cable to the micro USB port in the bottom of Galaxy Note 5 as shown below. Please note the orientation of the cable. The narrow side of the connector should be on top. For Samsung USB cables, the USB icon should be facing upwards as shown below. If you put it in the wrong orientation and push it violently, you may damage the USB connector on the phone and the cable. Step 3: Plug charger into an electric socket. You can plug the charger into an electric socket or extension. If there is a switch for the socket, turn the power on. Step 4: Wait till Galaxy Note 5 is fully charged. The indicator LED in the top left of Galaxy Note 5 (see Galaxy Note 5 layout) should turn red. With the official Samsung charger, it should take about 90 mins (from 0%) to charge the battery to full. You can check the status by waking up the screen. In the lock screen it should shows you the battery charging status. Once Galaxy Note 5 battery is fully charged, the indicator LED should turn green. So, it is not necessary to wake up the screen to check the charging status. Once Galaxy Note 5 battery is fully charged, you can and should disconnect USB cable from Galaxy Note 5. It is recommended to unplug the charger from the socket or turn off power for the socket. Is fast charging harmful to Galaxy Note 5 battery? The official Samsung charger for Galaxy Note 5 in your box is actually a fast charger (adaptive charger). This is why you can charge Galaxy Note 5 in about 1.5 hours. Fast charging is supported and enabled in Galaxy Note 5. You cannot disable it. This is different from Galaxy Note 4, in which you can disable fast charging if you are not comfortable with it. Fast charging is achieved through elevated voltage (from 5V to 9V), not through increased current. The adaptive charger has a special chip to communicate with the battery (and the phone) to determine the proper output power depending on battery level and other parameters. Once the battery level reaches above about 50-60%, the charger will function as a normal wall charger and fast charging is essentially disabled. Theoretically, fast charging may increase wear and tear to the battery cells due to higher charging power. But technically, the impact is very marginal. You should not worry too much about it. It may slightly shorten life span of Galaxy Note 5 battery. But the gains of shorter charging time usually offer more value for the phone. How to use wireless charging to charge Galaxy Note 5 battery? Like Galaxy Note 4, Galaxy Note 5 also has a built-in wireless charging coil. This means you can charge Galaxy Note 5 battery through wireless charging. To use wireless charging to charge Galaxy Note 5 battery, you need a wireless charging pad. Unfortunately, Samsung did not bundle it in the box. Galaxy Note 5 wireless charging supports both Qi and PMA charging standards. So, it is easy to get a wireless charging pad for Galaxy Note 5. It should cost you less than $40. 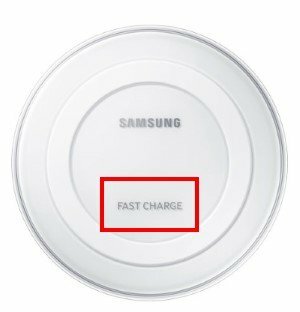 Please note, if you want to use “fast” wireless charging for Galaxy Note 5 (see next section), you have to use Samsung’s fast wireless charging pad. There are no offers from other vendors. It is very simple to use wireless charging to charge Galaxy Note 5 battery. You just put Galaxy Note 5 in the center of the wireless charging pad. The charging pad should illuminate certain color (for Samsung wireless charging pad, it is blue) to indicate the charging is progress. Once Galaxy Note 5 battery is fully charged, the charging pad will also change color. For Samsung wireless charging pad, the color is green. Of course, you can check the charging status by waking up the Galaxy Note 5 screen. In addition to normal wireless charging, Galaxy Note 5 also introduced fast wireless charging, which is 50% faster than normal wireless charging. Unfortunately, only Samsung currently offers the fast wireless charging pad. It will cost you about $70 in Amazon. Please note, Samsung sells both normal wireless charging pad and fast wireless charging pad. For fast wireless charging pad, it is clearly marked with “fast charge” as shown below. Fast wireless charging pad will function as normal wireless charging pad if the device does not support fast wireless charging. Currently, only Galaxy Note 5 and Galaxy S6 edge+ support this. Must I charge Galaxy Note 5 battery before using it for the first time? Samsung recommends you to charge Galaxy Note 5 battery before using it for the first time. This is not a requirement, just a recommendation. In reality, as Samsung does not offer 1-for-1 replacement in many regions, you have to test Galaxy Note 5 before making payment. The new Galaxy Note 5 battery should have about 50% capacity when leaving factory. It is enough for you to try and test the phone. If you want, you can use Galaxy note 5 till it reminds you to connect to the charger. Of course, if you want to play safe. You can charge Galaxy Note 5 battery to full before using it. But is is NOT necessary to leave it on the charger for 8 hours. What’s the typical charging time for Galaxy Note 5? Using the official adapter charger: about (usually less than) 90 mins (1.5 hours) . Using normal Samsung wireless charging pad : about 3 hours. Is leaving Galaxy Note 5 on the charger overnight harmful for the battery? No, there are no evidences to show it is harmful to Galaxy Note 5 battery. But it is a BAD habit. Then, is leaving Galaxy Note 5 on the charger overnight good for the battery? No, there are no evidences to show it is good for Galaxy Note 5 battery,. How to disable Galaxy Note 5 fast charging? Unlike in Galaxy Note 4, you cannot disable fast charging in Galaxy Note 5. If you really want to disable Galaxy Note 5 fast charging, you can use non-adaptive chargers, i.e., normal wall chargers. Why fast charging is not working on Galaxy Note 5? You need use an adaptive charger (like the one in your Galaxy Note 5 box). Why fast charging is not fast when charging my Galaxy Note 5 battery? after battery level reaches about 50-60%. Also, it is important to insert both ends of the cable tightly into the charger and Galaxy Note 5. I was told, to use fast charging, I must plug the charger to the wall socket, not an extension. Is this true? As long as power is supplies to the charger, the charger has no idea it is from a socket or an extension. Of course, stable voltage is important to keep the charger cool and efficient. Why is Galaxy Note 5 battery still charging when it is 100%? 100% means reaching 100% based on estimation. It can take a few more mins, even longer, to reach “fully charged”. Fully charged is a hardware state of the battery, not an estimation. Do you have any questions on Galaxy Note 5 battery, on how to charge Galaxy Note 5 battery, or on how to use wireless charging and fast wireless charging to charge Galaxy Note 5 battery? If you have any questions on how to charge Galaxy Note 5 battery properly, please let us know in the comment box below. The port of my note 5 is damaged so it can’t be charged anymore and the battery is drained to 0%… can the wireless charging be a solution to be able to charge the device again even if it is turned off ? Yes, of course. Wireless charging works even when phone is off. The led indicator light will be on automatically once the phone is on the wireless charging pad. When battery is low, you cannot power on the phone. You need to wait a few mins. when my battery is 37% my note 5 turns off why? After it is powered off, can you powered it on without connecting it to a charger? There is no minimum current requirement. But if it’s too small, it will take very long time to charge. If the current be is lower than what’s being used, your may see the battery percentage decreases. Anyway all USB chargers should have a minimum output current of 500mA. Hi..My phone is a sumsung note 5.Someone gave it to me with no charger.when i first used other chargers…the phone battery reaches 100% in less than 30mins. Not until this week, i tried to charge it but some are not even working, one im using now is a samsung charger but it takes more than 3 to be fully charged. Different chargers may have different output current (power). For a normal 5V 1A charger, 3-hour charging time from 0 to 100% is normal. If you use Samsung’s adaptive charger (fast charger), it should take about 1.5 hours. If you charge Note 5 battery from 0 to 100% in 30 mins, it should explode 😁. Note 5 cannot switched on without charging is on.. when plugged out the charger it shut down immediately. What is the wrong? What’s the battery level shown when you connect the phone to the charger? I’ve had a note 4 and just upgraded to a note 5. When I used my wireless charging pad for the note 4 I had put a wireless receiver in the back of the phone under the cover. Was that not needed to charge it wirelessly? Do I need a wireless receiver to use the wireless charging pad with the note 4 and note 5? No, Note 5 supports wireless charging natively. You do not need the receiver. Can you please tell me when exactly I should charge my Samsung Galaxy Note 5? Should I only charge it when the battery is low (when the phone reminds me to charge it) or is it totally fine to charge it when its battery is not low like 20% – 70%? What is the prefect and safe time to charge my phone? Thank you. Charge the battery only when you need to do it. When charging, you should avoid using the phone heavily, and wait till it’s fully charged. Enjoy the phone and don’t be the slave of the phone. Of course, you can. The charger is not tied to specific phones. Galaxy S3 doesn’t support fast charging. So it will be used as normal wash charger on S3. my note 5 does not change to green LED even charging the battery whole night but it shows it’s 100%. this happened after upgrading my note 5 to Android 7.0. how can i fix it? 100% (an estimation) doesn’t equal to fully charged (a physical state). The led turns green only when the battery is fully charged. But normally it would take a few mins from 100% to fully charged. For old batteries, it may take longer time. But it should be less than 30mins. Are you using the original charger? You can disconnect and charge it again. i am using the samsung wireless charger but everything unchanged and the only difference is upgraded to android 7.0. anything related to this? Sometimes, it’s due to some bugs. You can simply switch to USB charger for once. when should i charge my note 5? above or below 15%? You charge the battery when you need to do so. There is no definite number for this. When you charge the battery, you should avoid heavy usage and wait till it’s fully charged. How can i get a sound notification when my galaxy note 5 is fully charge. No, there is no such an option for notification sound when battery is fully charged. You can check the LED color. I don’t believe it. It’s up to you to trust such so-called tips. is it okay to drain the battery before charging it? It is NOT recommended. You may damage the phone or battery. Although the phone has its own protection mechanism to power off the phone when battery level is lower than certain level. But the battery level is estimated (always with errors). If the phone was suddenly turned off due to lack of battery (before the mechanism is triggered), the battery or some components may be damaged. You can turn off fast charging and fast wireless charging in Settings — battery. Can we use adaptive fast charging adapter for normal wireless charger? Will it effect the normal wireless pad or samsumg note 5? Will it charge phone as fast as fast wireless charger? You can use any wired charger/adapter to the wireless charging pad. The recommend charger actually is Samsung’s fast (adaptive) charger for both wireless charging pad and fast wireless charging pad. The charging current to the phone battery is regulated by the phone and the charging pad. The normal wireless charging pad cannot output more than 1A (5V) regardless of the charger connected. Fast wireless charging pad requires the adaptive charger to charge faster than normal wireless charger. I don’t think you can remove the icon. But you can remove the percentage in Settings – battery – percentage on status bar. I have had my Note 5 since December 2015. I just bought an official Samsung fast wireless charging stand. Ithe worked perfectly the first couple of days. Then it started only charging for a couple of seconds before flashing a message stating wireless fast charging paused. I have tried plugging it in elsewhere, when I turn the phone off to charge, it does the same thing but in a cycle of fast charging, off, fast charging, off…. If I unplug the wireless charging stand and plug the USB straight into my phone it will fast charge. I only have one wireless charger. When I googled this issue it seems to be common, but I couldn’t find a clear solution or even cause. Is it a phone issue or charger issue. Is it related to the marshmallow upgrade or not? Are your using some thick cases or covers for your Note 5? Also when fast charging stopped, does it charge your phone? You can also try to turn off and then turn on fast wireless charging in settings – battery. I recently bought a portable charger for a trip I’m getting ready to take. I’m not sure of the quality, but it looked reliable and it was on sale at a store that’s getting ready to go out of business. Anyway, it has two USB imput slots: one that reads DC 5V-1000mA and one that reads DC 5V-2100mA. I have a Note 5 and am not sure which is the better to use. Does it make a difference? Are there pros and cons to either, or will it just not charge through one of them? The two ports will give you different charging rate. The 2100mA port can output up to 2100mA current (your note 5 will decide how much it takes). This means it should take 1.5 to 2 hours top charge your Note 5. Then 1000mA port can only output up to 1000mA current. It will take about 3-3.5 hours to charge your Note 5. Both should be safe to use for Note 5. The 1000mA port is mainly for old devices. That’s probably not true. How (fast) you charge the battery (as long as the battery support the charging currents) is not linked to usage. Anyway, you can disable fast charging on Galaxy Note 5 in Settings–battery. You can disable fast cable charging and fast wireless charging. I used my note 5 voice recorder app to record a 2 1/2 hr. meeting. Since it wasn’t fully charged, I used it to record while plugged into charger (the one that came with the phone) during meeting. When I played back recording next day, the phone heated up after only about 30 minutes of listening. I let it rest for a while then continued to play back the rest of the recording, starting and stopping it to transcribe. By the time I finished, the phone was very hot and power was down to 15%. Have recharged phone and it seems ok, but am wondering if what I did caused any harm to the phone. Not sure. You can just reboot the phone if the battery life becomes suddenly too low. I’ve used my Note 5 for 2 months now. The fast charging feature always works, until recently. I always turn off my phone while charging and only use the original charger that comes with the box. Usually it displays 3 trickling green dots with 1.5 hours charging time, but now it only displays 1 green dot with 3 hours charging time (means the fast charging doesn’t work, right?). I’ve tried plugging into wall socket (not extension), and charge while it’s on, no luck. I haven’t updated my software since I bought it (still the default Lollipop). Is it because of the charger? Should I purchase another charger? Is the adaptive fast charging for Note 4 compatible with Note 5? You need make sure the USB cable is inserted tightly. It’s not necessary to turn off the phone when charging the battery. You can check whether you turned off fast charging accidently in settings – battery. All Samsung fast chargers are almost identical. Note 4, Note 5, S6 and S7 can share one fast charger. You should charge the battery to full of you decide to charge it. Why would you stop charging at 80%? Enjoy the phone. Good habit and common sense are enough. My phone came with a weird looking fast charger box how do i plug it in? In the Note 5 box, it should be a normal fast charger. Inside box, you can also find the USB cable. What charger box are you talking about? You can take a picture and share it in our Facebook page so that others can give suggestions. I’ve got my note 5 like 2 weeks ago, and bought a wireless sasmsung charger for it as well. Now I’ve been reading things which say “heating damaged the battery” and the wireless charger sure heats up! So is the wireless charger good or bad in terma of its heat / safeness? First, it’s safe to use wireless charger. Galaxy Note 5 had sensors inside. If temperature is too high or too low, it will stop charging. When you charge the battery, it should heat up a bit depending on charging current. Wireless charging is usually at 1A, which is quite low for today’s battery. Fast wireless charging is usually only at about 1.5A. So the charging current is not an issue. When you use wireless charging, you may feel it’s slightly warmer. This is normal because of relatively low charging efficiency through wireless charging than through USB cable. But this should not affect your battery because the additional heat is generated in the coil, not battery cells. Take it easy. Enjoy the phone. Charge your Galaxy Note 5 battery when you need to do so and are convenient to do so. Take it easy. Don’t drain the battery to very low in purpose. Don’t always top up the battery when your battery can still last till you access the charger again. if none of them works, very likely, it is a hardware failure and you have to visit local Samsung service center. I had my note 5 for about 6 months now, and this month I started to charge it overnight. Is that bad for my battery? Also, I am mostly on power saving mode, so is that ruining my battery slowly? Thanks. It is not a good habit to leave the phone on the charger overnight. There are no evidence that it may harm your Note 5 battery. Disconnect the charger only if it is convenient to do so. It does not make sense to get up at 1am just to unplug the charger. Take it easy. Enjoy your sleep. This is more important than the battery. For battery saving mode in Galaxy Note 5, actually it is not necessary. It will NOT save much battery for you. Note 5 is very battery efficient. Will it extend your battery life? May be not significantly, even if it will. Charging a lot may shorten the battery life span. Charge Galaxy Note 5 battery only when it’s necessary to do so. I have problems with my note 5,sometimes will charge to 100% but i when unplug it, it immediately drops to 98%.Sometimes it takes forever to charge and stay at 90% but when i restart my phone it becomes 100%. Are you using the original charger and able? Did you install any battery saving/task manager/antivirus apps? Before unplug the charger, make sure the status in lock screen is “charged” 100% is just a software estimation. In another case, if you leave the phone on the charger too long after it is fully charged, you may get less than 100% reading after disconnecting from the charger. This could be normal. For slow charging, you need make sure the cable is inserted fully into the charger. i buy new note 5 almost 10hours in charging the battery not yet full. i check 7hours on charging 92% then i checked again 10hours still 92% sir. It should not take so long to charge Galaxy Note 5 battery. Are you using the original charger and cable? If yes, make sure the cables are inserted tightly into the charger fully, and inserted into the phone tightly. I am getting the same problem, my mobile battery in nothing going up than 83%, i am using s5 charger…. What should i do? Did you try other USB cables and chargers? I am using my Galaxy Note 5 for tethering, which drains the battery fast. The article says leaving it plugged in is a BAD HABIT. If I don’t leave it plugged in (usually USB), then I’m draining and charging the battery at a high rate. If you use tethering/hotspot for considerable long time (not 5-6 mins only), you should connect the phone to the charger if possible. The screen on My Note 5 just turned blue while charging and displays factory mode download speed fast product name sm-n920v current binary samsung official faplock on secure download enabled ap swaev b:2 k:0 s:0 downloading do not turn off target not sure what to do? or what this is? You are in download mode because you pressed volume down + home + power buttons when rebooting the phone. You can hold power button until it reboots. I have had my Note 5 for 6 months and every couple of weeks when the battery drains and it powers off. I charge it for hours with different original chargers and it won’t charge past 0% I tried to do a force restart but it just restarts and then dies any thoughts. It’s better to visit Samsung service center to check the phone. It sounds like some possible problems in USB port or main board. Hello. While using my Note dies very fast. I would like to know if using social apps aid in draining my battery. You need check battery usage details in Settings– battery — battery usage. If you get questions on it, you can take a screenshot and share it in out facebook page so that others can help you. For social apps, it depends on the settings of the app. Can I use a normal samsung charger to chrage my note 5? And what size should be? Regarding V and mA? Yes, you can use normal wall charger to charge Galaxy Note 5 battery as long as its output is 5v, 0.5-2.1A. But the charging time will be a bit longer depending on the current output. Do I need to turn off the device while charging? No, it’s not necessary to power off Note 5 when charging. But you should try not to use it heavily when it’s being charged. Hi. I know this has been answered before, but just to make extra sure. I know the effects of fast charging are marginal, but where I live, taxes and exchange rates make Note5 cost more than a fortune and I want to make it last *as long as possible* and since the battery cannot be replaced I do worry about it. Yes, you can use them. But it is hard to say whether they can extend battery lifespan. Good habits are more important. For battery replacement, you can replace it in local Samsung service center. The cost is about $50. I don’t want to “extend” the battery life span, but rather avoid reducing it. If these old, slow charges will help that, I’ll use them. Slow charging usually is good for battery. At least it’s not bad. Samsung usually stocks parts for about 2-3 years after its initial release. 1. I don’t see a light of any color – where should it show on the Note 5 while charging? 2. Is there a way to have the phone give a notification sound when fully charged? (That would be a super-useful feature). 3. is there any value to letting the battery discharge to zero or almost zero before charging? Sorry, a correction – ignore #1 – red light did come on eventually. Usually, you check the color of the LED to see whether it’s fully charged. It’s not necessary to fully discharge the battery before charging. It’s not good for your battery. Charge the battery when you need to ( not whenever you can). Hi, I just purchased my Sn5, I migrated from a mega2 to the Sn5 and love it. The only problem I’ve found is; last night my wife wanted to get up early and as ked me to set an alarm. Set the alarm and laid the phone on nightstand and went to sleep. Alarm never went off. Checking the settings I found the phone to be at 0% charge. Is this normal?. What nightstand are you referring to? If the phone is powered off, alarm will not work. Enjoy your toy. Even the fast wireless charger is slower than the adaptive charger. Hi, of late i have noticed that the micro USB connector that plugs into my 4 months old Samsung note 5 gets REALLY hot REALLY fast, almost as soon as plug it in. This is I believe the adaptive charger and cable that came with the phone. You could barely touch after a minute or two, though it appears to be fast charging. Its getting so hot so fast that I fear an explosion or my phone over heating so have to quickly unplug it. This does not seem to be an issue when I use an older Samsung cable from an older phone. Is this a manufacturing problem with the adaptive charger ? This is really frustrating as I do not expect this kind of poor quality from a flag ship Samsung product for which I paid premium price. I am not even sure if the warranty covers the charger. Which USB connector are you referring to? Are you using the official charger with the bundled cable? What’s the charging time? If the cable is faulty or not connected tightly, it usually takes longer time to charge. Yes it’s the official one that came with the phone . Which I bought directly from Samsung . There were never any severe heating up of the micro usb cable connector until a few days ago . Now it heats up almost immediately as soon as I plug it in and becomes almost untouchable within just a minute or two . And it’s plugged in tight . It still charges but I did not feel safe to leave it in to charge when it gets so crazy hot so fast . As I mentioned , no issues when I used another older Samsung charger cable I had from an earlier phone . If it’s too hot, it’s better not to use it. Sometimes, the wires inside may get partially damaged if you bend it heavily. You can use other Samsung USB cables. Anyway, most quality USB cables should work. Just don’t use the cheap USB cable from handphone shops. Get normal, branded USB cable from computer store. Many cheap USB charging cables are designed for 500mA current. The wires inside are too thin for 2000mA currents when using the Samsung charger. It will slow down the charging and in worst scenarios, it may cause fire. Latest update . Went to Samsung Servoce CENTRE and they confirmed the charging cable was faulty and dangerously overheating . They don’t have an explanation but did exchange the cable for me since it was within the warranty period . And they confirm that continuing to charge when the cable was seriously overheating would possibly have resulted in phone damage or even possibly risk of fire etc . I don’t know how common is this problem but I world suggest that if the micro USB head or any part of the charging cable or plug becomes very hot to the touch during a charge then you should probably bring it back to Sansung ASAP. Especially if you routinely charge your phone overnight unsupervised . Thank you for the update the info. It is not common. Samsung cables actually works very well for a few years. But it the cable is bent or twisted, it may be damaged quickly. For your case, it is very likely just because of bad luck. I charge my phone while its off and I saw the blue light. After 3 hrs its still blue. When I saw there’s no even 1% in my phone. Amd I used wire charger to have 3% then I opened it. When I opened my phone and put now in a pad and its now charging. In the first 3 hrs with the blue light but its not charging. It will damage my battery? Do you mean blue light in wireless charger? Anyway, it should not damage the battery. Otherwise, you cannot charge it later with normal wall charger. Hello , when I charge my Note5 it gets to 100% , but the led doesn’t turn green . . Sometimes I leave it over nite and when I wake up it reads 100% but I still get no green led. Normally, it takes a few mins from 100% to fully charged. This is normal. But it should not take more than 20mins. LED will turns green only when the battery level is fully charged. If the phone has problems with “fully charged” state, the led will not turn green. If the problem can be easily re-produced, you may visit local Samsung service center to check the hardware. When i charge my note , i always get my charger (especially micro usb side of the cable ) get heated . Is it normal in this device or there is some problem ?will it cause any damage to my phone or to my battery ..? If you are using the official charger and cable, it should be safe. Make sure cable is inserted tightly. Don’t use low quality charger or cable. Hi, the way to use slow (normal) charging in the note5 is to actually plug the USB side of the cable halfway through to the wall adapter. You will actually feel a short stop before going into fast charging mode. That way you might help the battery last longer, if you are not in a hurry everyday. Don’t charge your Note 5 in that way. It will NOT make these battery life longer. When you connect the charger in that way, the current may be not stable and actually may cause damages to your battery, at least it will not extend battery life of your Note 5. You should get a normal wall charger with lower currents output if you don’t like the heat. Quality of the charger is also important. How long should i charge it for the frist time? Doesit effect how long it stays charged? Once Galaxy Note 5 is fully charged, it’s safe to disconnect it from the charger. With the bundled faster charger, it should take less than 1.5 hours. It’s not recommended to connect Note 5 to the wall charger after it’s fully charged. HI need some help here. I just bought new note 5 yesterday and opened the sealed box at 11pm. It was at 1%. I tried everything to drain it even downloading trivia cracks and playing for an hour. It is now 9am and it is still at 1%. My screen is even on a high setting. There has to be something wrong am I right? I am slightly paranoid about malfunctioning phones as my note 4 did not work properly for a year. Who asked you to drain the battery? You should not discharge it completely for a new phone. Charge the phone to full, then try again. If the battery level doesn’t change after connected to the charger, you may try to reboot the phone. Also pay attention to the led color when connected to the charger. Hi team! When i bought the samsung note 5, it was on 1%. is it normal? coz it is the first time i use samsung so i have no idea what to expect. plus i only have my samsung for about 5 days and since then i have to charge it every single day coz the battery drains out like crazy. is there any chance of my note 5 being faulty? i always thought it must be that i didnt charge it for 8 hours like most people say, but when i read your article, i was like nope! must be something wrong with the phone coz i fully charged it before using it for the first time . Normally, the new Note 5 should have about 50% battery. This is for you to test the phone because in many regions, Samsung only offers repais, not 1-1 exchange if there are any problems during the warranty period. It is NOT necessary to charge 8 hours. Once it is fully charged, you should disconnect it from the charger. For battery life, Galaxy Note 5 should normally offer about 3-5 hours screen time for most users. You should check the battery usage details in Settings–Battery–battery usage to get the details of the battery usage. You can post a screenshot in our facebook page if you have problems to read the details. Thanks 🙂 so that means my phone is normal right? By the way, how do you read the serial number of the phone? I am having trouble filling out my warranty card ? You need check the details of battery usage before drawing any conclusions. But if you can get 3-5 hours screen time, it is normal. The serial number can be found in Settings–About device — Status. My Galaxy Note 5 isn’t fast charging anymore after having the phone for 4 months. I’ve plugged into several outlets using the original cord and no fast charge. What’s funny is that the charger fast charges other Samsung phone except for mine. Did factory reset and that didn’t fix it. Any suggestions? Mostly 5 hours. Depending on how much battery is gone. It doesn’t show “fast charge” at any point. Please make sure you insert the USB cable tightly to the phone. It could be something wrong with your USB port/connector on the phone or the mainboard as you tested the cable and charger on other phones. As your Note 5 is surely still under warranty, you can check the phone in local Samsung service center. They should replace the connector or mainboard under warranty. Please note, you need backup the phone before visiting them because very likely they will reset the phone first to exclude any software issues. Hi. What will happen to my battery and the performance of my phone if I don’t charge it for 8 hours? It’s OK to disconnect the charger once the Galaxy Note 5 is fully charged. It’s not necessary to leave it on the charger for 8 hours when for the first time. Hi Is it better / necessary to turn off your Galaxy Note 5 when charging? No, it’s not necessary to power off Galaxy Note 5 for charging. Normally, you should power off Galaxy Note 5 only when you are not going to use it for extended time (e.g., a few days) or due to legal requirements (e.g., in some airplanes). But you should not use Galaxy Note 5 heavily (e.g., play games) when it’s being charged. Picking up a call or sending a message should be OK. I looked over the internet and found that you should keep your battery around 40%-80% to prolong its shelf life. Also, is fully charged your Li-ion battery to 100% will decrease the battery shelf life? Shelf life means keeping it on the shelf without using it. Anyway, don’t trust such nonsenses. Such reports always forget to tell you frequent charging causing more problems. Anyway, enjoy your Galaxy note 5 with good charging habits. Good habits include: charge only when you need charge the battery; charge until it’s fully charged when charging the battery; disconnect the charger once the Galaxy Note 5 is fully charged. If you intend to use Galaxy Note 5 more than 3 years, you should consider to replace the battery after 18 to 24 months anyway. normally how long the note 5 battery lasts ? What do you mean last? Most battery can still be usable after 2-5 years under normal usage. But the capacity always decreases with time. After 2 years, normally, it will lose about 20 to 50% capacity. Hi! I’ve just gotten my Note 5 and I have a question nagging me since my Note 3 ‘era’. So, I use my mobile a lot and I have a habit of charging my Note 3 when the battery reaches 20~%. I’ll charge it either to 80~% range to full. Now that I’ve moved on to Note 5, I did the same thing out of habit, charging from 23% to 73%. Will it affect my mobile’s battery if I were to charge this way? If it does affect my mobile, how would it affect it? Do give me your advice! It’s not a good habit. It may affect the battery. When changing, it’s better to charge the battery fully before unplugging. Charge only when it’s needed. If the 30% can last till you access the charger again, it’s not necessary to top it up to 70%. Of course, your bought the phone for use. So, your usage and conveniences should be your top priority. Don’t scrafice your usage and conveniences. The battery can only last 2-4 years. You can replace the battery for about $50 in Samsung service center. Unlike Note 3, you cannot get cheaper replacement battery. Anyway, enjoy the phone. Replace battery after about 18-30 months (depending on usage) to make it work for you for 3-5 years. I just want to ask is it bad for the battery if my note 5 is on fast charging and the battery and adapter gets hot? Is there other way to prevent it getting too hot? It should get hot. It’s physics. If you charge the phone overnight, you can get a quality slow charger with 500mA or 1A current output. The battery will be cooler. Please note the quality of charger is very important. I mean will the heat harm the battery alot? No, as I know. The manufacturer have to do such tests before releasing the products. Hi, feel a little lost here. I see that the charger for the Note 5 differs structurally from the usual 3 pin charger ( for my current note 2). How do i go about using the new charger when I can’t seem to fit it into the plug port? Would really appreciate some help here! Did you get there handset from local distributor? The power adapter may be different in different regions because different standards for power socket. The official local set should have proper plug. Check with the seller although most power adapter works globally at 110-240v. For some unknown reasons, my note 5 does not show charging sign on the battery status even it is actually charging. The ADB debugging is not working and ADB could not find the device. I have talked to Samsung Live Chat and went through all reset procedures (including wipe data and cache) but could not solve the problem. In the end, I though draining all the battery may be equivalent to remove the battery to reset the phone. So I gave it a try. I drained the battery until I could not start the phone anymore, then I plugged the phone with the faster charger, it FIXED the problem! hiii. i switch from an iphone to a note 5 recently and what struck out the most is the charging time. though the fast charging is really splendid (assuming it works immediately when i plug it in… which is not really often), normal charging time can take ages. I have plugged in my phone for more than 5 hours yesterday and it has managed to only reached 60%. furthermore, if i plug it into my portable charger, it charges realllllly slowly!! as compared to an iphone of course. Is there any way to make sure that it could charge faster when using a portable charger? or even a wall plug? (i am using the original fast charging adapter from samsung btw) thanks! Also make sure you insert both ends of the cable are interested tightly. If there are no problems with the USB cable, the charging time is limited by the output current of your charger. Galaxy note 5 can take up to 2A current. This is actually the maximum current for a USB cable (except the USB type c ). Hi. I just bought my note 5. While I was answering the things asked upon starting, I notice my battery was only 1%. I didn’t continue. Instead, I turned off my phone and charged it until it was full. I’m afraid this might affect my battery life. I got disappointed knowing new note 5 should have at least 50% battery life. Was my action okay? Hi sir how long should i charge my first galaxy note 5 to make battery more good? Should i charge 8hours?or what? And charge 8hours is good for battery? Once it is fully charged, you can disconnect the charger. It is not necessary to put the new phone on the charger for 8 hours. Your phone should serve you, not the other way around. Sir can u give me your facebook account because sometime i want to ask u sth? One other quick question: if leaving the Note 5 charging overnight neither hurts nor helps.the battery then why do you say it is a BAD habit? You need check battery usage details to find out which apps are draining battery. As explained in some comments before, if you leave the phone on the charger after it is fully charged, there are still currents going through. There are no evidences that this could damage or hurt the phone battery. But it keeps the battery in a “strained” state. This is not good for battery in long terms. If you have the habit of keeping these phone on the charger overnight, it’s better to use a wireless charger. Anyway, your conveniences should be the top priority. Phone is for use. Thank you very much! The Google app was the major culprit. hi there, when you say that the impact of fast charging is very marginal, to what extent do you mean by that? I have been looking everywhere online to find out if fast charging will harm the phone. I plan to have the phone for about 3 years so I do not want to damage the battery by fast charging. in other words, if I charged my note 5 with fast charging every time, how long will it be before battery life starts to decrease ? Nobody can give you the number. You can always use a low current charger if you believe fast charging will significant affect the battery. Battery shelf life and normal wear and tear are major factors in determine battery life. Most owners normally need change battery after 12-24 months depending on usage. Again, it’s not wise to limit the usage of a $600 phone by considering the wear of a $50 battery. Most cases should be fine unless it is too thick or made of metal or some special materials. All official Samsung cases has no issues with wireless charging. It depends on the case. if the case is too thick, you may not able to use wireless charging without removing the case. But most cases should have no problems with wireless charging. There is no issue with leaving phone on wireless charger because once battery is fully charged, there is no charging current going through the battery. This is different from wall charger. Take it easy and enjoy the phone. You say it is a bad habit to leave your phone on the charger over night. But you also say that doesn’t harm the battery. Then why is it a bad habit? When the battery is fully charged, your phone cannot shut off the current supply if it’s connected to the charger. A trickling current has to be maintained and goes through the battery. Under this state, the battery is still in charging state. This doesn’t harm the battery directly, at latest no researches can confirm such direct damage. But putting the battery in the charging state to too long may affect the lifespan of the battery cells. You can imagine it in this way. After exercise, if you still have to keep walking or running although at low speed, to maintain the strained state, you will get very tired. So does the battery. My screen comes on during a fast charge on the wireless pad and does not turn off. How do I prevent this? Is the screen on when your Note 5 is being charged? Or only when using wireless charging? If the screen on when charging Note 5, very likely, you turned on Stay awake in Settings–developer options. Turn it off. The Fast Charging for my Galaxy Note 5 was working normally at first this morning when I started to charge from 2%. I did not check the charging status until after 1.5hrs, expecting that it would be fully charged by then. However, I realised that it had stopped charging at only 43%. When I unplugged the USB cable from the Note 5 and plugged it in back, it continued charging using the Fast Charging for an hour until it was fully charged. This is the second time it happened. The first time it stopped at 47%. Could you please help me with this? When you found it stopped charging, what’s the icon for battery in the status bar? With the lightning or not? Anyway, you may try another USB cable and make sure it’s inserted tightly fire both ends. I think the battery icon still had the lightning. During the first time, I also remember the small end of the USB cable was hot when I checked the phone after 1.5hrs. Could it be that it was still charging but not through the Fast Charging? Anyway, I will monitor the charging next time and if it occurs again, I will try to get a new USB cable. It sounds like due to to the cable or the connector. Anyway, try a new cable. Thanks, this really put my mind at ease. I am charging my phone on the Fast Charge wireless charger from Choetech overnight. The charging pad will be hot the next morning. Does this affect the phone battery? Will it help if I disable Fast Charge for wireless charging on my Note 5? fast wireless charging pad may be hotter than normal wireless charging pad. But once Your Note 5 is fully charged, the charging pad should cool down by itself. If the charging pad does not stop charging, it is not good for battery although the Galaxy note 5 battery has its own protection mechanism. Anyway, check the manual of the charging pad to see whether the charging stops once battery is fully charged. In Galaxy Note 5, you cannot disable fast charging. Actually, fast wireless charging is not fast charging. The charging process is similar to normal 2.1A wall charger. Actually, there is an option to disable wireless fast charging in Settings under Accessories. I will check if the pad stops charging once the battery is fully charged. Yes, you can turn off fast “wireless” charging, not fast charging. The Settings for disabling fast wireless charging is to stop the fan in the charging pad, not to protect the battery. Actually, fast wireless charging stops automatically when you connect a normal wall charger (not the adaptive fast charger) to the charging pad. Actually, this is stated in the user manual of the Samsung fast wireless charging pad. But I am not sure whether this is common for other brands. In fast wireless charging mode, the charging is similar to use normal 2.0A wall charger (without adaptive fast charging). Anyway, it is not necessary to worry about Galaxy Note 5 battery when using fast wireless charging mode. Hi all. Just curious if anyone else’s Note 5 led indicator stays red while charging and does not change to green when at 100%. That’s what mine is doing and is kind of annoying. Just wondering if there’s any fix for this. Thanks. It should turn green when it’s fully charged. Please note 100% doesn’t mean fully charged. You need wait a few mins after it reaches 100%. In the lock screen, if it says charging, it means it’s not charged and the led should be red. If it says charged, the led should turn to green. Thanks for the quick response, Simon. I’ll give it a shot and let you know if that’s the issue. Thank you Simon. You’re absolutely correct. I don’t see “FAST CHARGING” any more when I plug in my Note 5. I use the cable and adapter that it came with but to no avail. Is the update what stopped it from fast charging or is it an internal thing? What’s the charging time? You need check and make sure the cable is inserted tightly in both ends. Not sure. You may reboot the phone to see whether it helps. Okay, I’m not understanding. With 60% battery I put my Note 5 phone on the wireless Samsung charger pad (not a “fast” charger) and after 5 minutes it stops and the blue light on the pad starts blinking. If I pick it up and put back on …it will charge for another 5 minutes. I’m trying to get 100% charge but it seems like it won’t automatically go there and stops every 5 minutes. Why can’t I get an automatic 100% charge with the wireless pad? Is it a Samsung wireless charger? Normal wireless charger should work. Are you using some thick case/cover for your Note 5? So I’ve heard two different theories. One says to let my Note 5 completely die before I recharge to “train” the battery for optimal performance. The other was to not let the battery get below 30% as this may “harm” the battery. Which one do you think I should do? The first one is for old battery. it is not necessary for Galaxy Note 5 battery. The second one is wrong. The principle is that you charge the battery only when you need charge it. For example, your battery has 60% left, you will not be able to charge it before it is used up, then you should charge it. If you know the battery is enough before you can access the charger, then it is not necessary to charge it. Of course, when charging, you should wait till the battery is fully charged. Hi, how long do i have to charge it for the first time? For 8 hours or just until it reaches 100%? Until it is fully charged. 100% is different from “charged”. The LED should turn from red to green once it is fully charged. Anyway, it should be less than 2 hours with the bundled charger. The new Galaxy Note 5 battery should have about 50% capacity when you get it. You can even test the phone if you need/want before charging it. If you say fast charging may increase wear and tear to the battery cells due to higher charging power, can i use my note 2 charger for note 5? Thanks. First, you should not worry took much about the fast charging. Second, yes, you can use the note 2 charger for your note 5. Any quality charger should work.